When you have a sewer problem, you may need more than a sewer video and inspection. A backup in your home’s drains is usually the first indicator that you need help. Since water flows downhill, it’s the shower, tub, bath, kitchen, or laundry drains in the lower level of your home that tell you something is wrong. 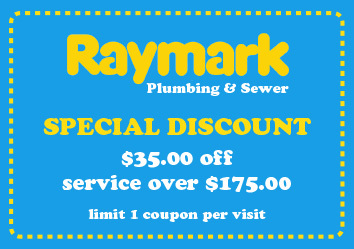 Call Raymark and we will clear the drain and get the line open. We run water to ensure everything is flowing freely, and we make sure you can flush the toilet and use the shower so you can stay in your home. To determine the cause of the problem, or if further problems are noted, we also video camera the side sewer line. This video provides important information regarding the condition of your line. For example, we may find tree roots, bellies (areas of the pipe that have fallen below grade and hold debris), holes in the pipe, cracks or broken pieces of pipe, dirt, and rocks. In addition, your neighborhood tells us a little bit about your sewer line. The majority of Seattle side sewer lines are concrete. But some higher end homes were built using tile because it is stronger and more durable than concrete. Our technician reports his findings to our Utilities Supervisor. The supervisor reviews the video and the findings. If needed, he will visit the property to assess and provide further recommendations. If he writes a proposal for recommended repair work, we email that to the customer, along with the video. 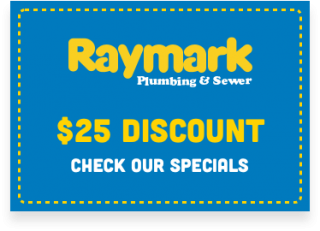 Raymark uses trenchless technology to replace side sewer lines. We were the first in Seattle to offer trenchless to residential homeowners. The beauty of trenchless is that only two points need to be dug, and new pipe is pulled from one of those points. The result is little disturbance to the landscape. If the side sewer problem extends to the street, we recommend lining the sewer pipe instead of using trenchless. This is because trenchless in this example requires creating an opening in the street. Street work significantly increases the cost of the job. Lining the pipe is a process of coating the existing pipe with resin. Lining is only an option on a sewer line that has not collapsed. If a repair needs to be made, the replacement material is CPVC plastic. A partial repair using CPVC can be made with existing concrete or tile pipes. Watch the video and review the proposal. The proposal explains where the problems are in the line, the immediacy of when the work is needed, the recommendation, and the price of the work. There may be more than one option available. If you have questions after reading the proposal, please call our office at 206-430-1954 or send an email. In many situations, timing is important. For example, if a side sewer line is collapsed, the lining option is not available. So, if your proposal mentions any risk of collapsing, you’ll want to address this soon to avoid potentially larger problems and costs. Also consider the cost of doing nothing. For example, a side sewer line may have cracks, holes, or breaks, but is still functional. Keep in mind that anything you put down the drain, especially chemicals and other contaminants, has the potential to leak or leach into the surrounding soil. Schedule your Raymark appointment today by calling 206-430-1954, or complete our Contact form.